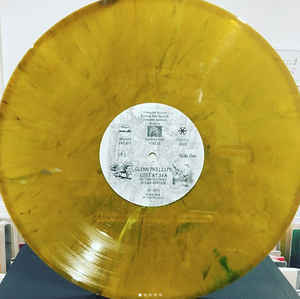 VERY Limited Golden Edition ! Feeding Tube just pressed up 50 copies of this classic on 'clear yellow splatter' vinyl - Glenn has 10 of them and we have just 6 to sell. The original 2015 double album reissue sold out some time ago and this is bound to become a stone cold collectors item. If you missed out on the 2015 reissue of this milestone release , here is your chance to get hold of what wil become one of the most sought-after artefacts of Glenn's illustrious musical career. Thanks to all who bought the 40th anniversary reissue of 'Lost at Sea' - as many of you know Glenn re-convened the original players last May to re-create the music live from the album. He's very kindly given us access to a clip from the performance including part of a radio show where he talks about his pet dog, Kubert the inspiration behind 'Dogs'. Shagrat Records is immensely proud to announce the reissue of one of the greatest electric guitar instrumental albums of all time, Lost at Sea. 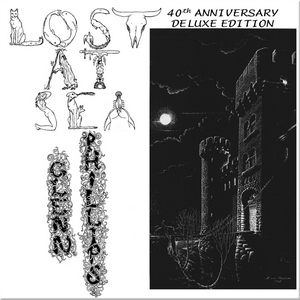 In 1975 Atlanta, Georgia-based guitarist Glenn Phillips released his debut LP, Lost at Sea on his own Snow Star label. Back in the mid-70s, this wasn’t just a bold move, it was unheard of as musicians simply didn’t release records under their own steam. Of course a couple of years later, come the punk explosion DIY became the order of the day but back then it was unprecedented for someone to record, produce, design and press their own LP. Pretty much unknown to the world at large in 1975, Glenn had already made a name locally for himself as part of Atlanta’s Hampton Grease Band, a quintet of wilfully weird and wonderful characters, whose only double LP for US Columbia 'Music to Eat' was notorious as being the worst selling album in the label’s history! Though in the decades that followed, it would become a widely-sought-after album that has exerted an influence on everyone from Pere Ubu to Phish. The Hamptons had carved an enviable reputation as one Atlanta’s best, an experimental twin-guitar fuelled hot bed, sharing bills with just about every great band that came through the city, from the Allman Brothers and Spirit, to the Grateful Dead and the Doors. They’d also caught the eye of Frank Zappa and his manager Herb Cohen. And significantly Glenn especially had been spotted by another musician on his way up the ladder Lowell George. When George and Little Feat played the city in the south, Phillips would sit in with them, prompting Lowell to proclaim Glenn as ‘the most amazing guitarist I’ve ever heard’. The Hamptons broke up in 1973 and Glenn played with a bunch of other Atlantan aggregations including the Stump Brothers until a convergence of events in his life resolved him to record his own material at home and put out the recordings as Lost At Sea. The LP included sterling musically support from some great musicians including his former band mates, Jerry Fields and Mike Holbrook. It took a while for the word to get out but reaction was warm and very positive and a copy of the LP eventually fell into the hands of British DJ John Peel who was totally enamoured and played it regularly on his show. As its reputation spread, it reached the ears of the people at Virgin, who licensed the record, and Glenn became one of the first American acts on the label. Virgin brought him over to tour the UK in October 1977 as support for Steve Hillage and released a second LP – but that’s a story for another day. Lost at Sea is a magical piece of work, that is sometimes lyrical, sometimes brutal but one which has stood the rigours of time remarkably well and still sounds as fresh as that day back in 1977 when Shagrat’s Nigel Cross first had his head bent by its magisterial playing. It has been long been out of print as an album though it was released by Glenn in 1992 as part of a double CD career retrospective, Echoes. And it remains a real trailblazer as an electric guitar instrumental LP, appearing some five years ahead of Zappa’s Shut Up and Play Your Guitar and some 17 years ahead of Tom Verlaine’s set, Warm & Cool. We’re thrilled to be working with Glenn and US label Feeding Tube on this special anniversary vinyl edition. The package contains the original LP (re-mastered by Glenn) as the first disc plus a second 12” of material that was recorded during the same period but never released before, mastered by our audio guru, Tony Poole who coordinated the overall sound. The more eagle-eyed amongst you will note that a few of these tracks ended up as very different versions on Glenn’s Lost at Sea and on his subsequent solo albums. The record comes in an expanded gatefold sleeve put together by Mr Poole that uses the original artwork and lettering plus some additional drawings by Kenneth Smith whose illustrations gave the original package so much character and mystique, a bunch of rare photos from the period plus expanded sleeve notes by Glenn himself and Terrascope’s Phil McMullen, long an admirer of Glenn’s magnificently potent and electrifying guitar playing. This is a run of 500 copies only, manufactured in the USA. There is no CD or download version of this set available. - Read it here !